Welcome to Sari's Sugar Free Recipes! All recipes were created by Sari. Enjoy! Peel beets and cut into wedges. Toss with balsamic vinegar and olive oil and place in a single layer in a pan. Sprinkle with salt, pepper, and dry dill. Roast for 1-1.5 hours, stirring occasionally, until tender and slightly browned at the edges. 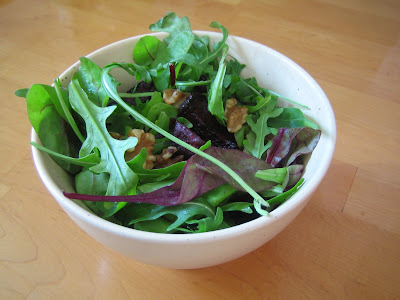 Allow to cool and toss with greens and walnuts. Before serving drizzle with vinaigrette and toss.